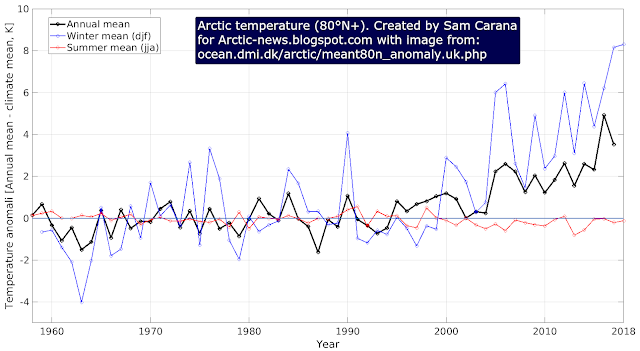 Arctic News: What Does Runaway Warming Look Like? As warmer water enters the Arctic Ocean from the Atlantic and Pacific Oceans, there is no thick sea ice left to consume this heat. 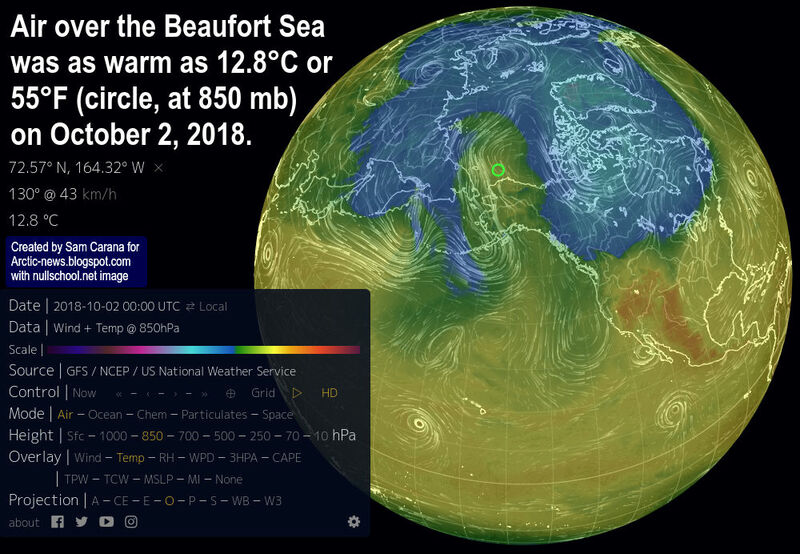 Some of this heat will escape from the Arctic Ocean to the atmosphere, as illustrated by above dmi.dk image showing very high temperatures for the time of the year over the Arctic (higher than 80°C latitude). 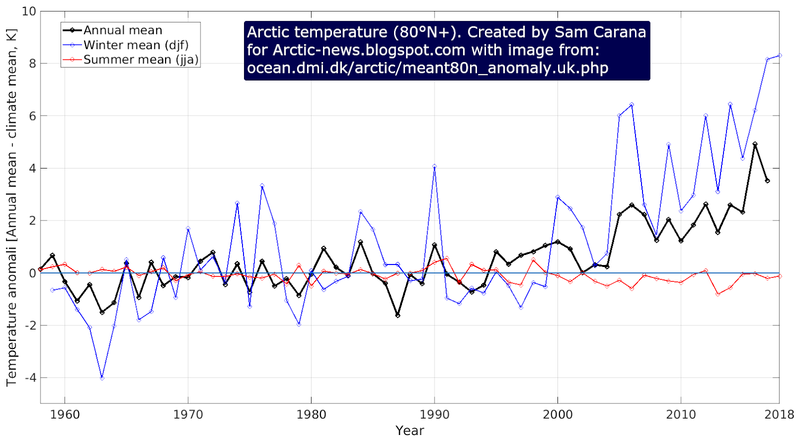 Above dmi.dk image shows that Arctic temperatures are increasingly getting higher during Winter in the Northern Hemisphere. Similarly, above NASA image shows that Arctic temperatures are increasingly getting higher during Winter in the Northern Hemisphere. 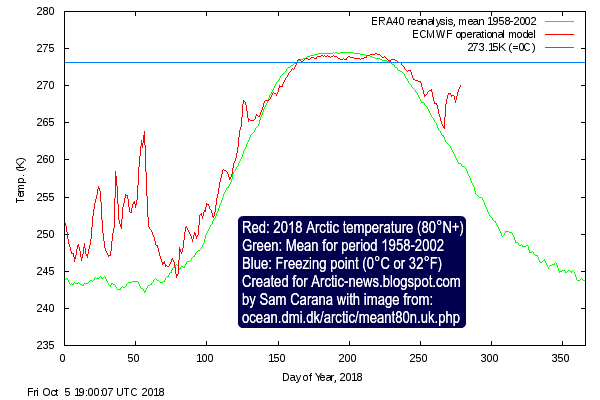 As the Arctic warms up faster than the rest of the world, the Jet Stream is becoming more wavy, allowing more hot air to move into the Arctic, while at the same time allowing more cold air to move south. Above image shows that the air over the Beaufort Sea was as warm as 12.8°C or 55°F (circle, at 850 mb) on October 2, 2018. The image also illustrates that a warmer world comes with increasingly stronger cyclonic winds. 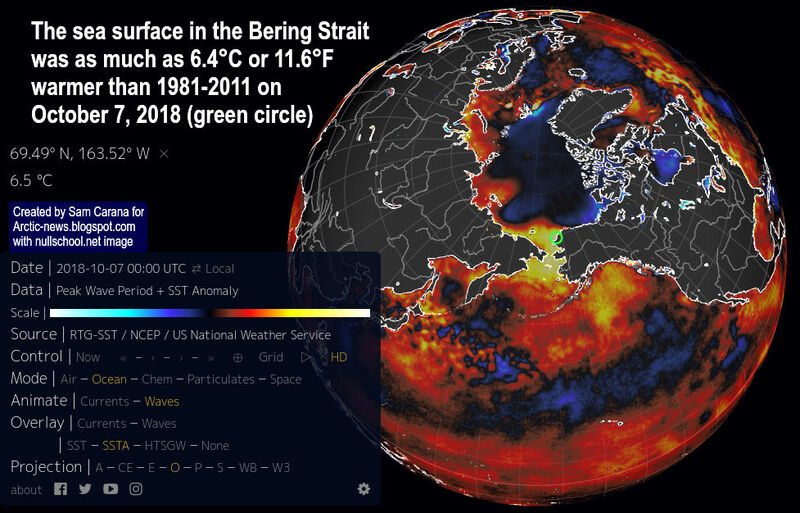 The images above and below shows that on October 2 and 7, 2018, the sea surface in the Bering Strait was as much as 6°C or 10.7°F, respectively 6.4°C or 11.6°F warmer than 1981-2011 (at the green circle). 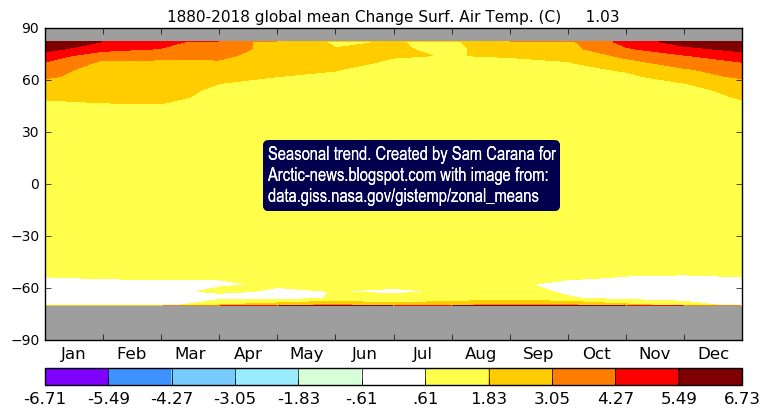 As temperatures on the continent are coming down in line with the change in seasons, the air temperature difference is increasing between - on the one hand - the air over continents on the Northern Hemisphere and - on the one hand - air over oceans on the Northern Hemisphere. This growing difference is speeding up winds accordingly, which in turn can also speed up the influx of water into the Arctic Ocean. Here's the danger. In October, Arctic sea ice is widening its extent, in line with the change of seasons. This means that less heat can escape from the Arctic Ocean to the atmosphere. Sealed off from the atmosphere by sea ice, greater mixing of heat in the water will occur down to the seafloor of the Arctic Ocean, while there is little or no ice buffer left to consume an influx of heat from the Atlantic and Pacific Oceans, increasing the danger that warm water will reach the seafloor of the Arctic Ocean and destabilize methane hydrates. 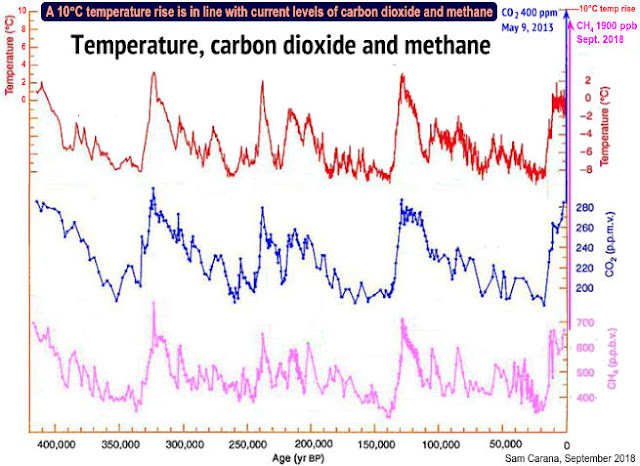 It's not just the influx of heat that is the problem. There's also the salt. Ice will stay frozen and will not melt in freshwater until the temperature reaches 0°C (or 32°F). Ice in saltwater on the other hand will already have melted away at -2°C (or 28.4°F). 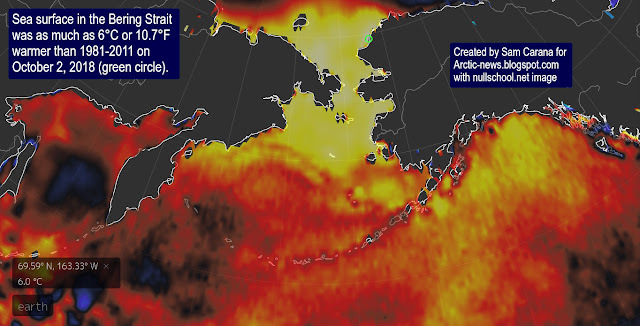 The animation of the right shows salty water rapidly flowing through the Bering Strait. With the change of seasons, there is less rain over the Arctic Ocean. The sea ice also seals the water of the Arctic Ocean off from precipitation, so no more fresh water will be added to the Arctic Ocean due to rain falling or snow melting on the water. In October, temperatures on land around the Arctic Ocean will have fallen below freezing point, so less fresh water will flow from glaciers and rivers into the Arctic Ocean. At that time of year, melting of sea ice has also stopped, so fresh water from melting sea ice is no longer added to the Arctic Ocean either. So, the Arctic Ocean is receiving less freshwater, while the influx of water from the Atlantic and Pacific Oceans is very salty. This higher salt content of the water makes it easier for ice to melt at the seafloor of the Arctic Ocean. Saltier warm water is causing ice in cracks and passages in sediments at the seafloor of the Arctic Ocean to melt, allowing methane contained in the sediment to escape. 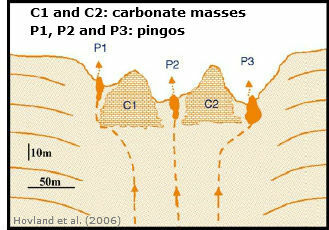 The image on the right, from a study by Hovland et al., shows that hydrates can exist at the end of conduits in the sediment, formed when methane did escape from such hydrates in the past. 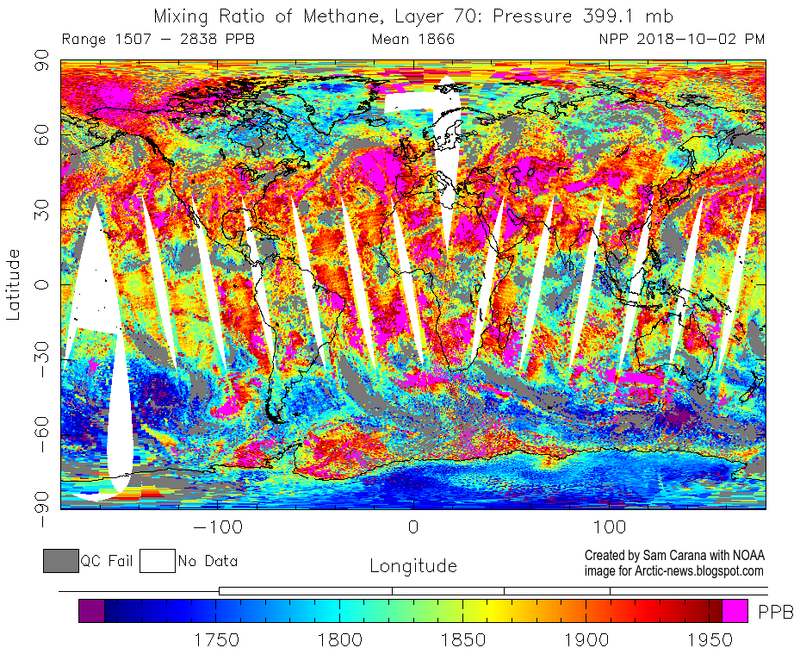 Heat can travel down such conduits relatively fast, warming up the hydrates and destabilizing them in the process, which can result in huge abrupt releases of methane. Heat can penetrate cracks and conduits in the seafloor, destabilizing methane held in hydrates and in the form of free gas in the sediments. 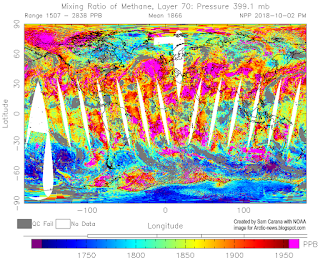 On October 2 and 7, 2018, peak methane levels were as high as 2838 ppb, respectively 2859 ppb, as the images on the right shows. 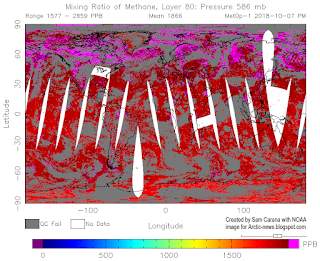 Methane levels over the Beaufort Sea have been high for some time, and have remained high at very high altitudes. The threat is that a number of tipping points are going to be crossed, including the buffer of latent heat, loss of albedo as Arctic sea ice disappears, methane releases from the seafloor and rapid melting of permafrost on land and associated decomposition of soils, resulting in additional greenhouse gases (CO₂, CH₄, N₂O and water vapor) entering the Arctic atmosphere, in a vicious self-reinforcing cycle of runaway warming. 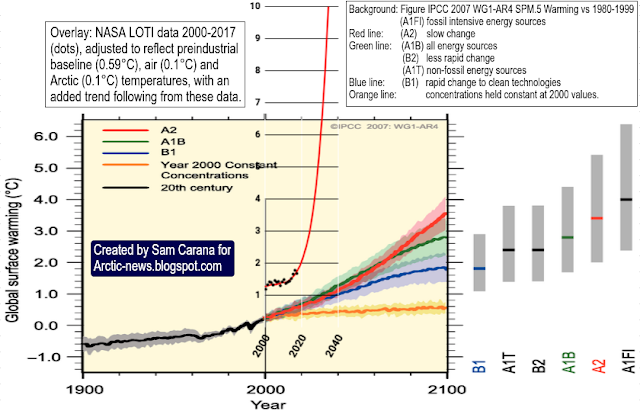 A 10°C rise in temperature by 2026? 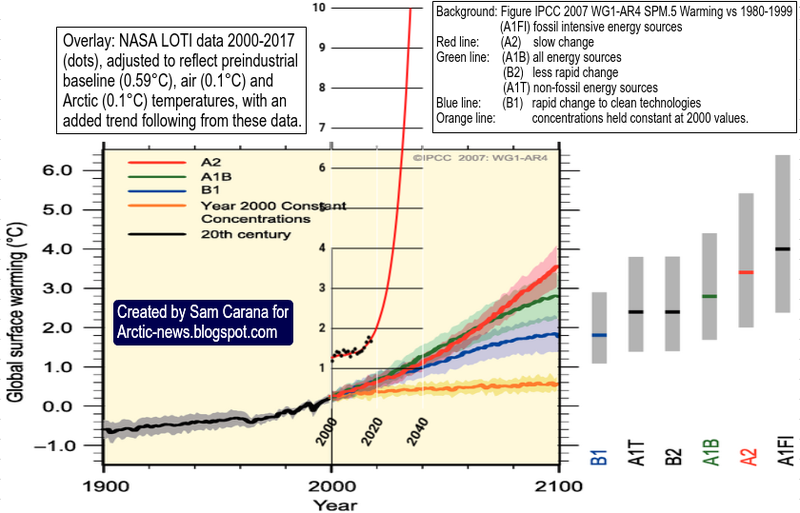 Above image shows how a 10°C or 18°F temperature rise from preindustrial could eventuate by 2026 (from earlier post). 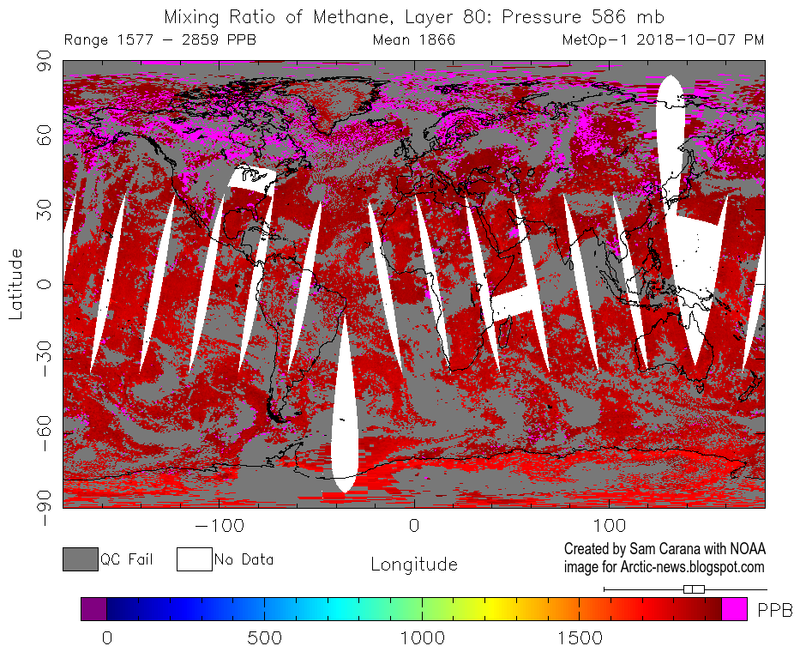 • Why are methane levels over the Arctic Ocean high from October to March? • How extreme will it get?